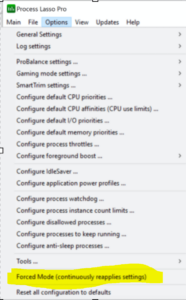 When enabled, Process Lasso’s Forced Mode causes Lasso settings such as process priority classes and CPU affinities to be continually reapplied, instead of only performed once on a given instance of a process. This is to deal with cases where processes set their own settings. 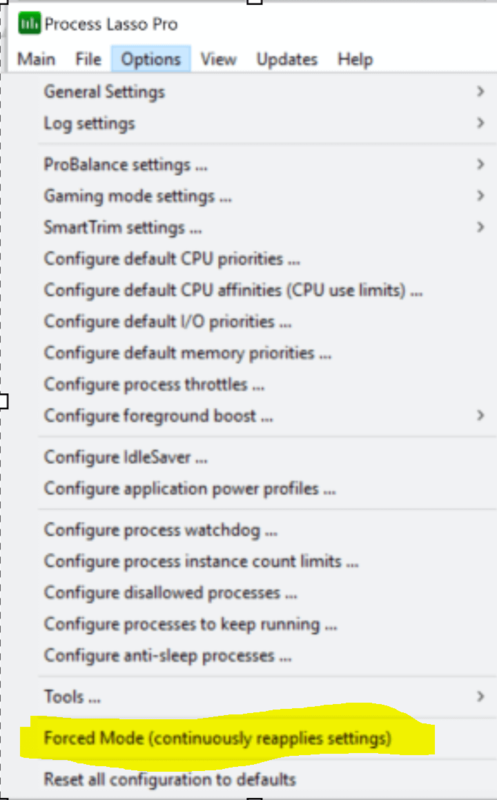 However, since it is assumed a process that sets it’s own settings knows what it is doing, this setting is disabled by default and Process Lasso will not try to ‘fight’ with the process for settings. When disabled, if a user rule conflicts with a process self-setting, a race condition can theoretically exist, though is normally not an issue since the launch of the process would have to occur within a handful of unlucky milliseconds of a given second.